5a: Lancer slashes horizontally with the golden spear. Hits mid. 5b: Lancer stabs with the golden spear, taking one full step forwards. Hits mid. 5c: Lancer slashes with yellow then red spear, taking one full step forwards. Hits mid. 2a: Lancer performs a low kick. Hits low. 2b: Lancer moves half a step forward, then performs a low spinning slash with the crimson spear. Trips the opponent. Hits low. 2c: Lancer moves half a step forward, and slashes with both spears. Hits mid. j.a: Lancer does a horizontal kick. Hits high. j.b: Lancer performs two downward slashes; a roughly 30° one with the golden spear and a 45° one with the crimson spear. Hits high. j.c: Lancer performs an upwards crescent spin with the crimson spear. Starts behind Lancer. Hits high. 6b: Lancer steps forward and does a mid cross cut with both spears. Hits mid. 6c: Lancer does two steps forward and performs two overhead high slashes. Hits mid. 236a/b/c: Lancer attacks with his spears. a version = Lancer stabs forward with the golden spear. b version = Lancer stabs forward with the crimson spear. 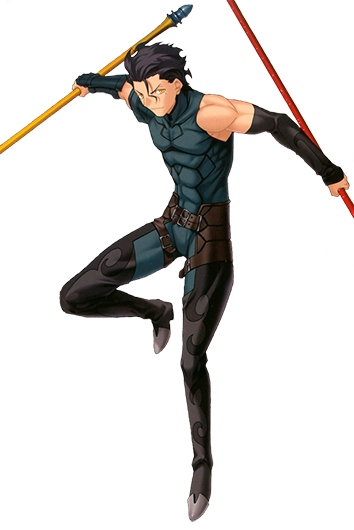 c version = Lancer performs a series of rapid thrusts. 646a/b/c: Lancer spins and attacks with his spears. a version = Lancer performs 2 forward swings. b version = Lancer performs 2 swings. The first hits low, the other high. c version = Lancer performs 3 stabs. The last stab is a launcher. 623a/b/c: Lancer spins and performs an uppercut. a version = A spinning uppercut. Launcher. Jump cancelable. b version = A spinning uppercut with a stab finish. c version = A spinning uppercut that ends with an overhead slam with both spears. a version = Lancer backsteps diagonally upward. b version = Lancer backsteps diagonally downward. c version = Lancer parries and counters if the parry connects. j.236a/b/c: Lancer kicks to the ground at high speed. a version = Kicks 45º backwards. b version = Kicks straight down. c version = Kicks 45º foward. 236236a: Gáe Buidhe: Golden Rose of Mortality - Lancer Stabs forwards with the golden spear. Deals 1500 damage. The opponent cannot heal past the damage done with this. Great Combo ender. 236236b: Gáe Dearg : Crimson Rose of Exorcism - Lancer Stabs forward with the crimson spear just like his other super. The opponent loses 100% mana. Deals 750 damage. 236236c: Lancer stabs the opponent with Gáe Dearg which makes them fall to the ground. He then jumps atop the spear and kicks off of it to spin attack with Gáe Buidhe 3 times before jumping up and throwing Gáe Buidhe into the opponent. 4000 damage. Adds chip damage to Normal Attacks and doubles chip damage with Specials. Basic combo. 100% meter startup for 4.3k damage. 100% meter startup for 5k damage, drains 200% meter. Note: On some characters (Rin, Saber, etc.) the 6b in the ground string (5b > 6b > 5c > 2c) must be ommited when they are falling, turning the string into: 5b > 5c > 2c. This is a safe mixup on block. If your opponent attempts to retaliate, you can use his command backdash to force a whiff and punish, or his counter to counter DPs, tracking moves, and the like. The throw after this mixup is so fast it's damn near unseeable, which makes people scared of the j.236C mixup. If they're really turtling and guessing on the throw/overhead, then use 2a as a low guardbreak. This mixup is good to keep your opponent honest. This gets Zero Lancer away from ANY punish attempts, and gives him ample time to punish whiffs with 2C or 5C, along with rekkas.